Populus grandidentata, commonly called large-tooth aspen, big-tooth aspen, American aspen, or white poplar, is a deciduous tree native to eastern North America. In northeast Ohio, it is in full bloom and the floss is falling off the fruiting structure and sticking to the sidewalks or turf. Populus grandidentata, commonly called large-tooth aspen, big-tooth aspen, American aspen, or white poplar, is a deciduous tree native to eastern North America. 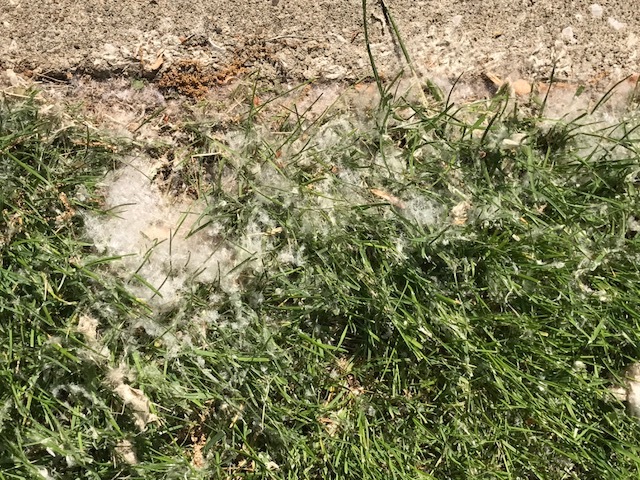 In northeast Ohio, it is in full bloom and the floss is falling off the fruiting structure and sticking to the sidewalks or turf. The tree grows in moist soil near streams, and frequently is one of the first trees to grow in abandoned fields and burned-over areas. Although widely distributed in Ohio, it is more common in the northern part of the state. It has a beautiful toothed leaf and light colored bark. This group of trees is located on Perry Public School’s campus. A ‘summer’ snow is around the corner when Eastern Cottonwood, Populus deltoides goes into flower.